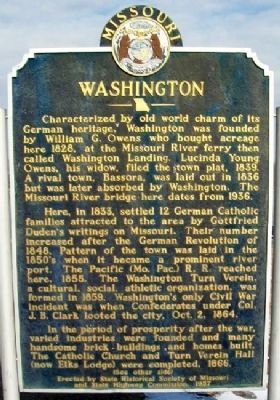 Characterized by old world charm of its German heritage, Washington was founded by William G. Owens who bought acreage here 1828, at the Missouri River ferry then called Washington Landing, Lucinda Young Owens, his widow, filed the town plat, 1839. A rival town, Bassora, was laid out in 1836 but was later absorbed by Washington. The Missouri River bridge here dates from 1936. Here, in 1833, settled 12 German Catholic families attracted to the area by Gottfried Duden's writings on Missouri. Their number increased after the German Revolution of 1848. Pattern of the town was laid in the 1850's when it became a prominent river port. The Pacific (Mo.Pac.) R.R. reached here, 1855. The Washington Turn Verein, a cultural, social, athletic organization, was formed in 1859. Washington's only Civil War incident was when Confederates under Col. J. B. Clark looted the city, Oct.2, 1864. In the period of prosperity after the war, varied industries were founded and many handsome brick buildings and homes were built. The Catholic Church and Turn Verein Hall (now Elks Lodge) were completed, 1866. A town of many industries, Washington achieved world recognition with a zither factory founded, 1866, by Franz Schwartzer, and today's corncob pipe industry begun in 1870's by Henry Tibbe. Tibbe and Ludwig Muench invented a plaster of paris process, patented in 1878, which turned the corn cob pipe into the "Missouri Meerschaum." 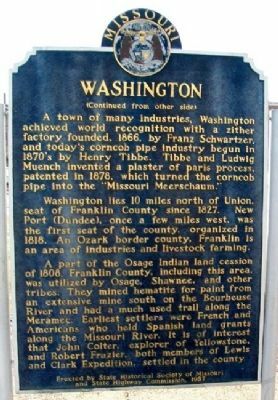 Washington lies 10 miles north of Union, seat of Franklin County since 1827. New Port (Dundee), once a few miles west, was the first seat of the county, organized in 1818. An Ozark border county, Franklin is an area of industries and livestock farming. A part of the Osage Indian land cession of 1808, Franklin County, including this area, was utilized by Osage, Shawnee, and other tribes. They mined hematite for paint from an extensive mine south of the Bourbeuse River and had a much used trail along the Meramec. Earliest settlers were French and Americans who held Spanish land grants along the Missouri River. It is of interest that John Colter, explorer of Yellowstone, and Robert Frazier, both members of Lewis and Clark Expedition, settled in the county. Erected 1957 by State Historical Society of Missouri and State Highway Commission. Location. 38° 33.646′ N, 91° 0.596′ W. Marker is in Washington, Missouri, in Franklin County. Touch for map. 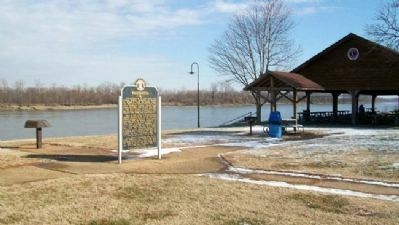 Marker is in James W. Rennick Riverfront Park, about 300 feet ENE of the intersection of Front and Lafayette Streets. Marker is at or near this postal address: 1 Elbert Street, Washington MO 63090, United States of America. Touch for directions. Other nearby markers. At least 8 other markers are within walking distance of this marker. The Lewis and Clark Expedition Across Missouri (within shouting distance of this marker); Wir Sind Freunde - We Are Friends (within shouting distance of this marker); Robert Frazer (within shouting distance of this marker); Waterworks Building (within shouting distance of this marker); Lucinda Owens Memorial (about 300 feet away, measured in a direct line); Zachariah Foss House (about 300 feet away); John Clayton Inn (about 300 feet away); Roettger Inn (about 500 feet away). Touch for a list and map of all markers in Washington. More. Search the internet for Washington. Credits. This page was last revised on June 16, 2016. This page originally submitted on December 5, 2012, by William Fischer, Jr. of Scranton, Pennsylvania. This page has been viewed 351 times since then and 5 times this year. Photos: 1, 2, 3. submitted on December 5, 2012, by William Fischer, Jr. of Scranton, Pennsylvania.